This heart rate monitor watch has everything you need to get started with cardiovascular training - running, jogging, or any kind of strenuous exercise. The watch is equipped with a stopwatch, an alarm function, and an LED backlight for easy night usage. Of course, it also includes a heart rate monitor chest strap and data functions including maximum, average, and present heart rate monitoring, as well as a calories burned display. 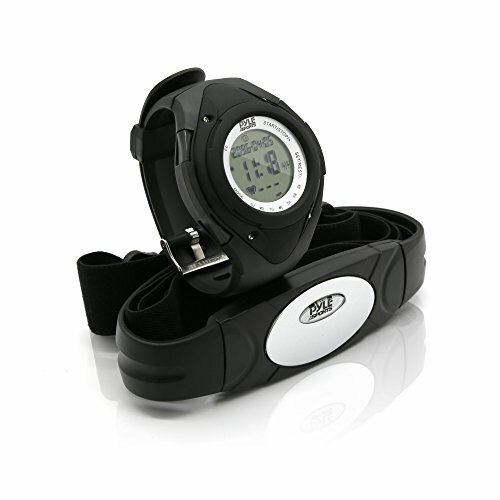 STAY FIT: This heart rate monitor and watch is the perfect addition to your training program. Monitor your heart rate as you run, jog, or doing any cardiovascular exercise. This watch also includes a chronograph, daily alarm & heart rate statistics. MONITOR YOUR HEART RATE: Simply wrap the included belt around your chest before exercising. Then, enter the heart rate monitor mode on the watch. While you exercise it keeps track of your current, maximum, and average heart rates. It also tracks your current and average speed. HELPS YOU TRAIN: Knowing your maximum heart rate can help you train at an optimal level. The calorie counter is conveniently equipped with a target training mode to help you reach your best levels and notify with an alarm you when you have. BY THE NUMBERS: Your watch generates a wealth of data from your workouts. You can view your total calories and average heart rate all at the touch of a button. Don't exercise without Pyle Sports! GREAT SPORTS WATCH: Includes time & date functions, a daily alarm and a chronograph with resolution up to 1/100 of a second. The LED backlight allows for use in low-light conditions or at night. The sports watch is also water resistant to 33 feet/10 meters/1 ATM.